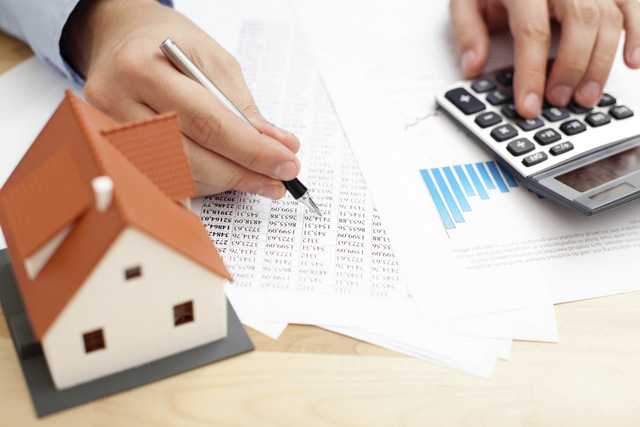 Thanks in large part to the continually low interest rate, mortgage originations rose 17% year-over-year in the first quarter, according to a new report from RealtyTrac. RealtyTrac’s Q1 2015 U.S. Residential Loan Origination Report showed that there were 1,551,865 loans originated on single-family homes and condos in the first quarter, down 6% from the previous quarter but up 17% from a year ago. According to RealtyTrac’s report, the total dollar volume of loans originated in the first quarter was $377 billion, down 1% from the fourth quarter but up 32% from a year ago. Refinance originations lead the way, representing nearly $256 billion in the first quarter or 67.8% of total loan origination dollar volume. Purchase loan originations represented $121 billion or 32.2% of total origination dollar volume, RealtyTrac’s report showed. As a share of total loan origination dollar volume, purchase originations reached a recent peak of 49.2% in the second quarter of 2014 followed by three consecutive quarters of decreasing share, RealtyTrac said. Of the approximately 1.6 million loan originations in the first quarter, 471,822 were purchase loan originations, down 25% from the previous quarter and up less than 1% from a year ago. There were 1,080,043 refinance originations in the first quarter, an increase of 6% from the previous quarter and an increase of 27% from a year ago. The results of the RealtyTrac report run directly counter to new information released Wednesday by the Mortgage Bankers Association. The MBA’s Weekly Mortgage Applications Survey for the week ending May 8, 2015 showed the refinance share of mortgage activity declined to 51% of total applications: the lowest level since May 2014. “A dip in interest rates early in the year combined with lowered mortgage insurance premiums for FHA loans breathed some life back into the refinancing market in the first quarter,” said Daren Blomquist, vice president at RealtyTrac. According to RealtyTrac’s report, there were a total of 995,968 conventional loan originations (backed by Fannie Mae and Freddie Mac) in the first quarter, representing 64.2% of all loan originations. 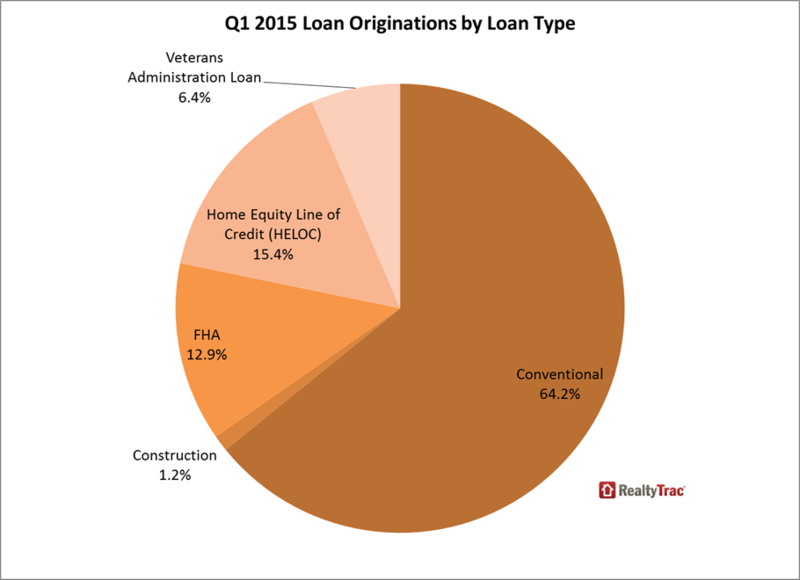 Conventional loan originations fell 5% from the previous quarter but were up 13% from a year ago. Conventional purchase loan originations in the first quarter decreased 27% from the previous quarter and were down 2% from a year ago, while conventional refinance originations increased 10% from the previous quarter and were up 21% from a year ago. On a local level, several large metro areas saw large jumps in originations in the first quarter. According to RealtyTrac’s report, for metro areas with a population of at least 500,000, the biggest increases in loan originations from a year ago were San Jose (up 72%), San Diego (up 64%), Oxnard-Thousand Oaks-Ventura, California (up 64%), Palm Bay-Melbourne-Titusville, Florida (up 61%), and Boston (up 54%). Other major markets among the top 20 for biggest year-over-year increase in loan originations included Salt Lake City (up 53%), San Francisco (up 49%), Los Angeles (up 48%), Denver (up 44%), Seattle (up 40%), Portland (up 39%), Bridgeport, Connecticut (up 38%), and Richmond, Virginia (up 35%).